Baraka, Dir. & Photographed by Ron Fricke, Concept by Ron Fricke, Mark Magidson & Bob Green, Music Supervision by Michael Stearns (MPI Home Video MP7060; 96:00), 1992/1995. 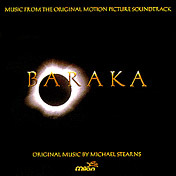 Baraka, Original film soundtrack by Michael Stearns/various artists (Milan 73138-35652-2; 48:00), 1992. 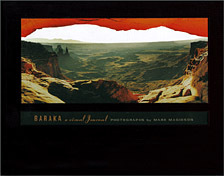 Baraka: A Visual Journal, Mark Magidson (St Anns Press, 120 pages), 2000. You can order the Baraka videos (VHS or DVD (new film transfer, new remastered audio), soundtrack album, and Baraka: A Visual Journal directly from Amazon.com. See the bottom of the page for an alternate take of the "Baraka theme" on Michael Stearns' Sacred Site CD, and another Ron Fricke film, Chronos, and the Godfrey Reggio films, Koyaaniqatsi and Powaqqatsi..
Somewhere in the great journey of the world cinema, something was lost. Early films had an important job to do, entertain, and still do. But the original classics of the medium strived to do more, to amaze us, to still our hearts with wonder at the marvels beyond the theatre walls. Early motion pictures took us places we couldn't go, showed us things we couldn't see, made us feel things we might not otherwise feel. Now, we have Species, Showgirls and Stop! or My Mom Will Shoot. The seasonal offerings from the traditional studios, and even some upstart independents underwhelm us with contrived filler recycled from last year's successes. Performers like Sharon Stone mouth obscenely self-absorbed odes about their "power" and "importance," then strip down and cavort lasciviously on-screen ... to a collective yawn. Nothing about the mainstream cinema is truly fantastic any more, not since Francis and George and Steven and Carroll and Philip and many others blew out the format restrictions and introduced new integrity to the crafting process ... of what is essentially the same old story ("the fight for love and glory"). But a few filmmakers actually strive for something more. Filmmakers like Ron Fricke. Previously a collaborator with Godfrey Reggio on Koyaanisqatsi, and the director of the IMAX films Chronos and Sacred Site, Ron Fricke has collaborated with producer Mark Magidson on a mystical documentary of global proportions. Making a non-verbal, non-linear film that comments on holiness and materialism, on an intimate scale, is no small endeavor. Baraka, named after a Sufi word for "the breath of life," is the result of that seven-year endeavor. Magidson, Fricke and composer Michael Stearns have crafted an audio-visual tone poem that meditates on the world and the varied cultures that clamber on its surface. In the tradition of Reggio's films (Koyaanisqatsi and Powaqqatsi), it would seem at first glance to beat the familiar "Man Versus Nature" drum (subtitle: What A Mess We're Making Of Our Planet) ... but it's from that resemblance that the filmmakers diverge. Baraka makes the exploration a spiritual one. Sure, we gaze upon vistas of natural and manmade landscapes, but we also stare upon landscapes that men and women have etched into their faces -- Japanese Noh performers, Aborigine warriors, rainforest children, they all bear the marks of their cultures. What is the purpose of these illustrations? Perhaps it's all part of a shared belief in something grander than the mere physical world. Making a film about that which cannot be seen or heard can't be much harder ... than discussing a film that does just that. Fricke uses the three senses that film appeals to (sight, sound, time) to suggest that which is extra-sensory. The way in which he does so is masterful. Baraka begins and ends with supremely spiritual images and sounds. Temple bells and ancient mantras mingle with wind and waves. Stars swirl and spin above remote deserts; closer in the sky, clouds wash and lap at the shores of mountain ranges like oceans of the air. Balinese men in a communal circle perform a "monkey dance," and hordes of the devoted swirl around Mecca. At every turn, the film lures us in with images of our reverence of the Unknown, and the Unknowable. Through scenes of biology, geology and technology (true to the genre, man's industrial and military thrashings get a particularly hard slam here), Fricke doesn't lose sight of our universal relationship with the infinite. It's the impalpable nature of faith that puts our material chaos in such stark perspective ... and allows us to gaze on more than a few images of true ugliness with fascinated awe. How could we do that?, I found myself wondering over and over again. Even visions of brutality and destruction, painstakingly shot in Todd-AO 70mm, take on a lyrical eloquence in the context of Baraka. If this had been done with less reverence, it might've degenerated into an ephemeral film to evict moans of "Far out" from the viewer. But, I think, the sea change is brought about by Michael Stearns' extraordinary soundtrack. A blend of source music and his own sweeping space music, the score is the narration of the film, the whisper in your ear and the scream across the chasm. In the overture, thundering waves provide the percussion to his introductory theme. Just as the film shows us the world as a whole, Stearns draws from around the globe for beads from which to assemble an acoustic necklace: "Mantra" from Somei Satoh, a hymn from Dead Can Dance,... a chant here, a temple bell there. A vision of Kuwaiti oil field fires is accompanied by Japanese Koto drums and Scottish bagpipes, an alloy that intensifies an already monstrous scene. Stearns' expert use of the soundscape enhances the magnificent imagery, and the union -- Fricke's cinematography and Stearns' music -- becomes a compact, ballistic vision that demands our wonder. As I said, the film is a glorious tone poem. Its meaning, and intent, are wholly dependent on the viewer's perceptions and interpretation. What I thought of it ... what you'll think of it ... and what a theatre full of viewers might think of it ... are entirely personal reflections of the enigma on the screen. Baraka holds up a mirror for us to lose ourselves in. Which is precisely what spirituality is all about ... an intimate adventure. As such, Baraka is a profound celebration of each culture's, each individual's, personal experience of our universe. Baraka is now available on videotape and laserdisc from MPI Home Video. Contact The Visioneering Group (Los Angeles, CA, USA), 1-310-395-4416, for more information. A self-described multicareerist, D.B. Spalding is a writer, musician, independent radio producer, computer consultant and online sysop; he writes frequently about music, film, computing and the mass- and multimedia. (C) Copyright 1995 D.B. Spalding. All rights reserved. An alternate version of the "Baraka Theme," as well as other selections from Michael Stearns' IMAX soundtracks (including Chronos), can be heard on Sacred Site, (Hearts of Space HS11038; 60:01), 1993. Brief RealAudio samples are available from Amazon.com. Ron Fricke's previous collaboration with Mark Magidson, Chronos, is available on DVD from Amazon. [9/26/2002: Sorry, currently out of print. //~Dbs] Though shorter, it features footage every bit as breathtaking; time-lapse photography captures historic locations and stunning vistas. Michael Stearns again provides a great soundtrack (once available on Sonic Atmospheres, no longer in print, so far as I know). Godfrey Reggio's groundbreaking films, Koyaaniqatsi and Powaqqatsi, available as a specially priced 2-DVD pack (subject to change). © Copyright 1997 D.B. Spalding/Korova Multimedia. All rights reserved.